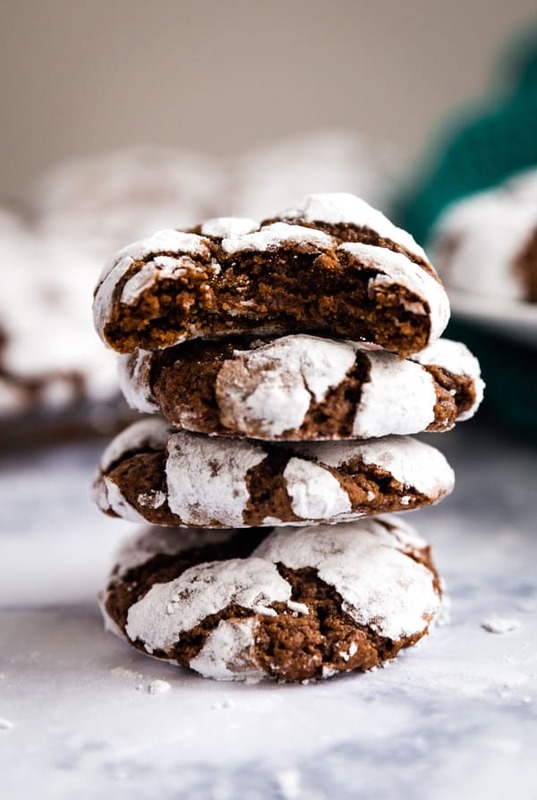 This Chocolate Crinkle Cookies recipe is a holiday family favorite- they’re deliciously chewy, chocolate cookies that are super easy to make and a definite crowd-pleaser! I’m sure you’ve seen these before. I mean come on, we all have. These festively pretty chocolate cookies seem to be a mainstay on every holiday cookie plate, at least they do around here. And with good reason! 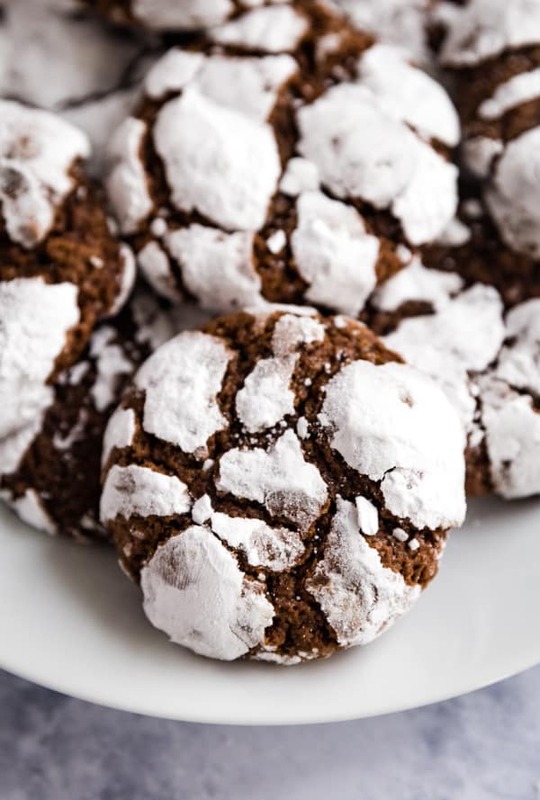 These chocolate cookies are so perfectly chewy and delicious that no one can seem to resist them. 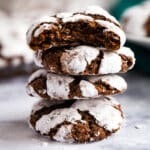 This chocolate crinkle cookie recipe is pretty difficult to screw up, even for those who aren’t the best bakers (like me!!). They fulfill everyone’s chewy-chocolaty-goodness-need beautifully which makes them a hot item on the cookie platter. While this makes a pretty good size batch, don’t plan on having any left. These little guys go fast! My biggest piece of advice is to go slow and steady when melting your chocolate. Chocolate can be pretty temperamental to work with and if you melt it over too high heat it will seize up creating a clay like texture. 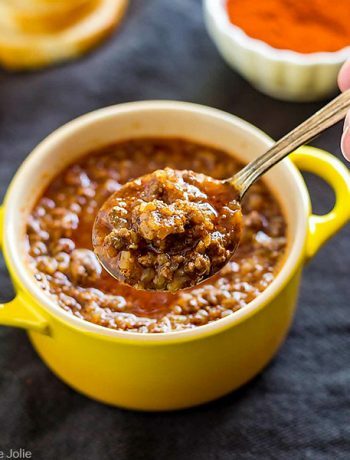 The way to avoid this is to slowly melt it over lower heat. You can do this by chopping the chocolate and using a double boiler and stirring frequently or you can check out my post to learn how to melt chocolate in the microwave. Be sure to chill the cookie dough well before rolling the cookies. This will help prevent too much spreading and make them easier to roll. I like to make sure I give the dough balls a nice, thick coat of confectioner’s sugar before placing them on the pan. Once baked, the cookies should deflate a little as they cool, but still be soft and chewy. 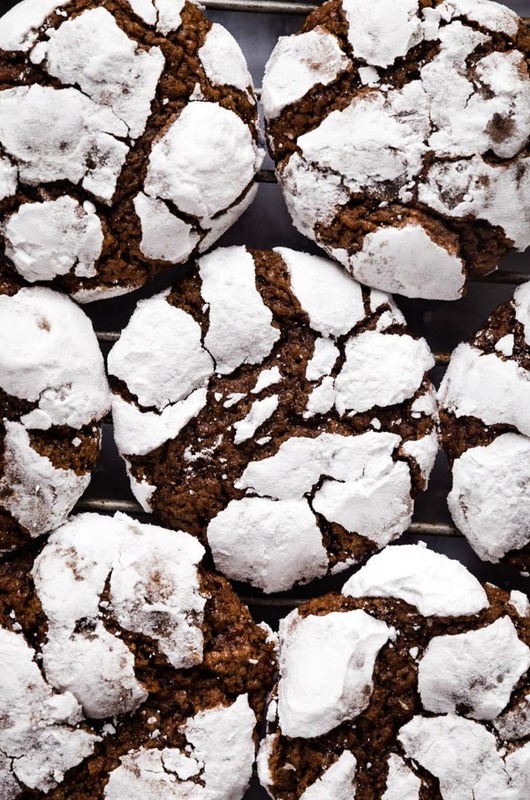 Can you freeze chocolate crinkle cookies? Yes, these freeze very well in an airtight container. How long do crinkle cookies last? They last around a week in an airtight container on your counter but for several months in the freezer. 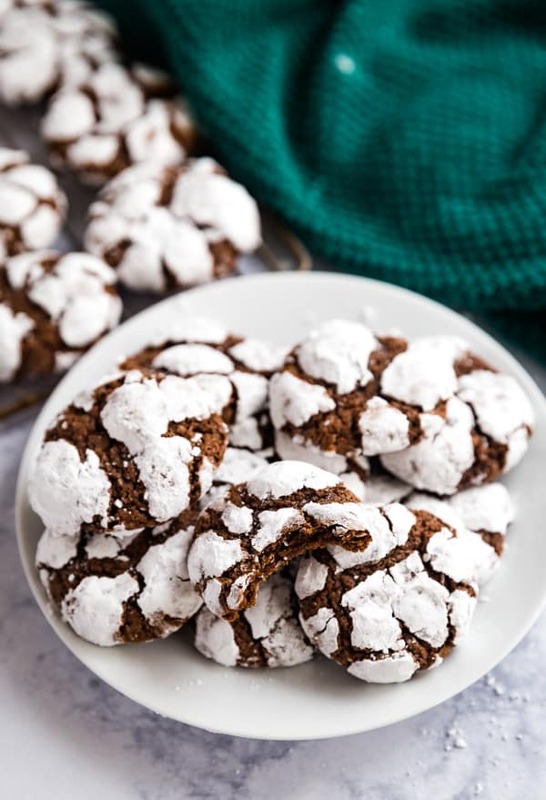 This Chocolate Crinkle Cookies recipe is a holiday family favorite- they're deliciously chewy, chocolate cookies that are super easy to make and a definite crowd-pleaser! In a large mixing bowl beat together oil, chocolate and sugar until light and fluffy. Add eggs and vanilla extract and mix until well combined. 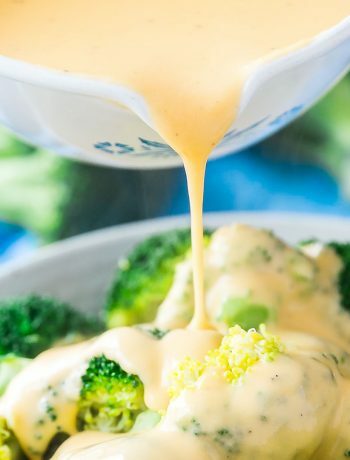 In a separate bowl combine flour, baking powder and salt and add to the wet ingredients. Mix until just combined (don't over mix) and chill for at least a few hours (I chilled it overnight). Preheat the oven to 350 degrees. Prepare cookie pans by either greasing them or lining with parchment paper or a silicone liner. Roll teaspoons of dough into small balls and cover in confectioner's sugar. 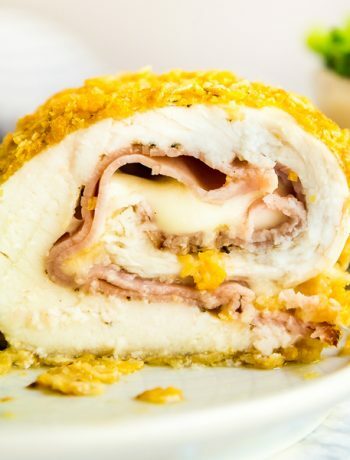 Bake for 10-12 minutes (don't over bake). Cool and serve. December 1, 2015 at 4:03 pm Thank you- my husband cannot get enough! December 1, 2015 at 4:03 pm Thank you- I hope you enjoy! December 1, 2015 at 3:50 pm Me too! Enjoy! 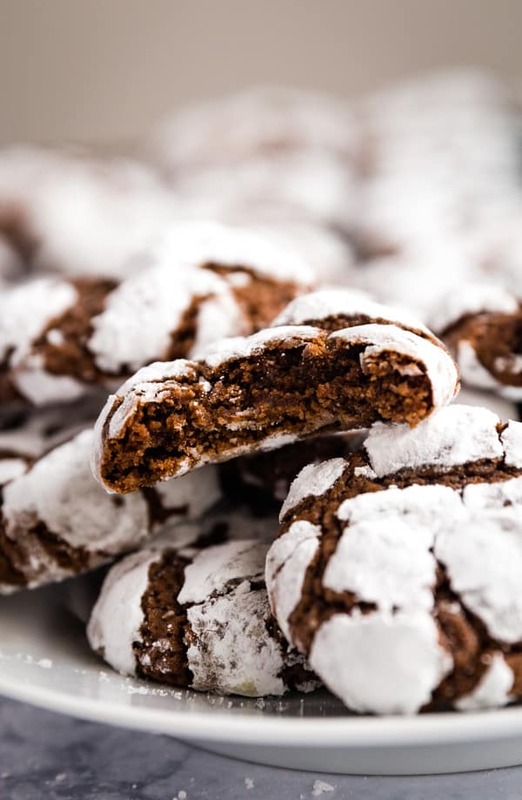 December 3, 2015 at 2:02 pm Thank you- they're perfect for a cookie exchange and the recipe makes a good amount. December 9, 2015 at 11:35 am Thank you! December 20, 2018 at 10:00 am I haven't made these in years! I think its time! December 21, 2018 at 5:04 pm We make them every year! December 21, 2018 at 5:03 pm Thanks Alyssa! December 20, 2018 at 8:52 pm My kids will surely love these!! They look so good! December 21, 2018 at 5:03 pm Thanks Toni! December 21, 2018 at 5:03 pm Thanks Lindsay! December 21, 2018 at 10:40 pm I just adore these! They are a Christmas staple! December 22, 2018 at 10:04 am Thanks Serena! December 23, 2018 at 5:38 pm just put the batter in the fridge, it looks more like cake batter is that normal? December 26, 2018 at 12:44 pm Yes, from a looks standpoint. It shouldn't be liquid-y per se, but it will definitely harden up in the fridge. Good luck!